The shock that Minneapolis restaurateur Jane Lawless is in for when Chester Garrity, her ex-husband, returns to a city that he swore he’d never see again is nothing compared to Chester’s own. After their divorce many years ago, he took off with his inheritance to travel the world, leaving Jane with enough seed money to open her first restaurant, which worked out well for Jane but less so for Chester. Now he’s back and penniless, or as he would prefer to say, between fortunes. He’s working an angle to make his next one by selling a priceless artifact recently looted from the Baghdad Museum, but it all falls through when he wakes up next to the dead body of his buyer with no memory of what happened the night before. Panicked, Chester flees the scene, eventually returning to cover his tracks only to find that someone has already taken care of that for him, but at what price? 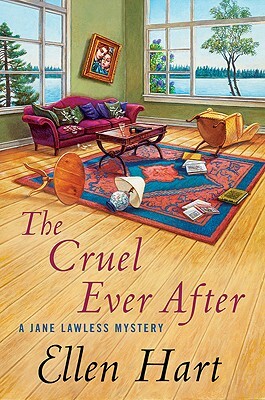 The Cruel Ever After, the newest Jane Lawless mystery from Lambda and Minnesota Book Award--winning author Ellen Hart, is filled with the intrigue and deception that makes it one of the most engrossing series on shelves today. ELLEN HART, "a top novelist in the cultishly popular gay mystery genre" ("Entertainment Weekly"), is also a Lambda and Minnesota Book Award winner. The author of seventeen previous mysteries featuring Jane Lawless, she lives in Minneapolis, Minnesota. Visit her Web site at www.EllenHart.com.